Best Toronto Stucco Homes, a division of The Spice Construction and Stucco, is an industry leader in the application of custom stucco systems. Our goal is your complete satisfaction. Through years of experience and trials, we have perfected a system sure to provide you with years of enjoyment. 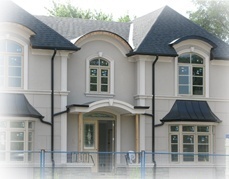 Best Toronto Stucco Homes is staffed by a team of professionals ensuring quality work every time. Our architects will work with you to design a custom look for your home or commercial building. Application is completed by a team of professional builders to ensure quality workmanship on every job. No job is too big or too small for Best Toronto Stucco Homes. Whether you are looking to reface the front of your home or reface an entire commercial building, Best Toronto Stucco Homes will tackle the job with professionalism every time. We offer a complete warranty on all materials and workmanship to protect your investment. More details about our warranties can be found on the Warranties Page. For a free estimate or more details about the services we offer, feel free to contact us. We will promptly answer your questions or contact you to schedule a presentation.